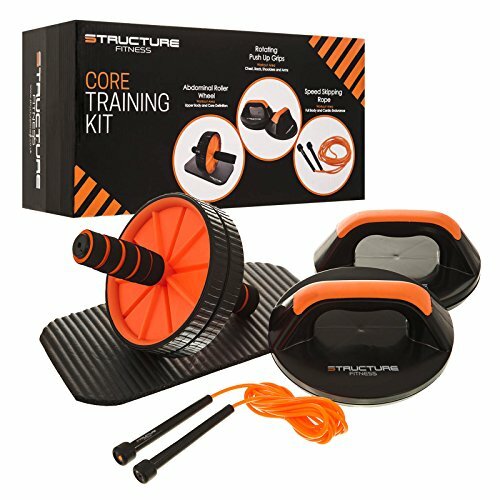 The Structure Fitness Core Training Kit provides a perfect range of equipment needed and is Ideal for improving upper body development, core, muscle tone, endurance and flexibility, for a total body workout. The Structure Fitness Core Training Kit comes complete with a set of Rotating Push Up Grips, an Abdominal Roller Wheel featuring comfort foam handle grips, a cushioned knee pad and a Speed Skipping Rope for functional integrated circuit training. - Helps develop and tone muscles across the back, shoulders, arms and chest.